Craig Anthony Miller “CAM”, A Brooklyn native artist working out of DUMBO Brooklyn, uses an exploratory process of mapping shapes and line work to mimic a stain glass style into images that repeatedly convey messages of strength over despair. The early visual narratives was expressed through images of Elephants, (ganesh), and Birds, the latter directly connecting with his mantra, “Always be mindful of your ability to fly”. 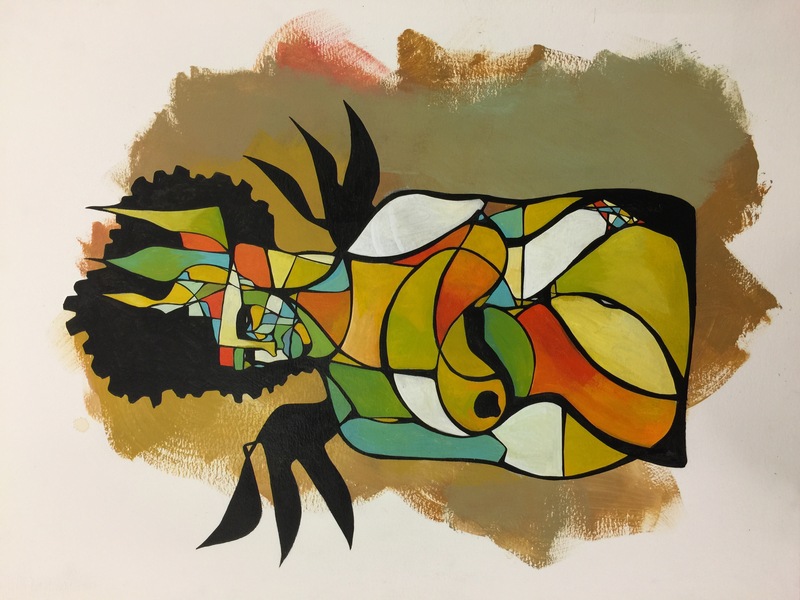 CAM’s latest inclination of Being Mindful of self Empowerment through Body, Mind and Spirit, is a reintroduction to figurative painting in a growing body of work based on women and men alike showing great awareness and strength of self beauty. This new work follows his new mantra, ”Always keep your head to your crown”. The crown is the key element to all the work. Like the bodies and faces , the crowns are seen as free flowing, imperfect, random, and fractured. They reflect the truth of a never ending process through the unknowing journey to self mastery.